Combine first 6 ingredients in a shallow dish. Add steak to dish; cover. Marinate in refrigerator for 1 hour, turning after 30 minutes (can marinate longer, if so desired). Prepare Quick Pickled Cabbage Recipe. Place cabbage in a medium bowl with garlic. Bring vinegar, soy sauce, sugar, and chile paste to a boil. Add onion, if you are using one. Pour hot vinegar mixture over cabbage; toss. Let stand at least 30 minutes (I refrigerated it, magazine didn’t specify). Remove steak from marinade, and discard marinade. Thread steak onto 8 (8-inch) skewers; sprinkle with salt (I just grilled the slices without the skewers). Place skewers on grill rack coated with cooking spray. Grill 2 minutes on each side or until desired degree of doneness. Grill tortillas 30 seconds on each side or until lightly charred; keep warm. 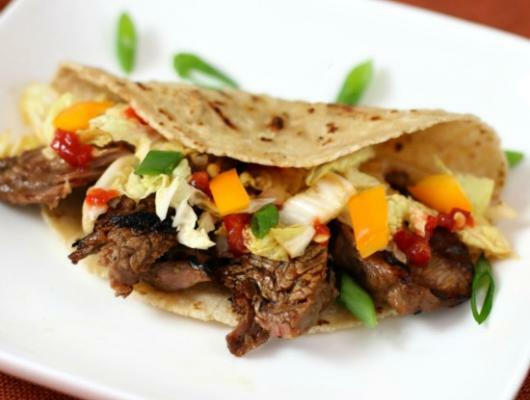 Place 2 tortillas on each of 4 plates, and divide steak evenly among tortillas. Divide the Quick Pickled Cabbage evenly among tacos; sprinkle with green onions and tomato (if using). 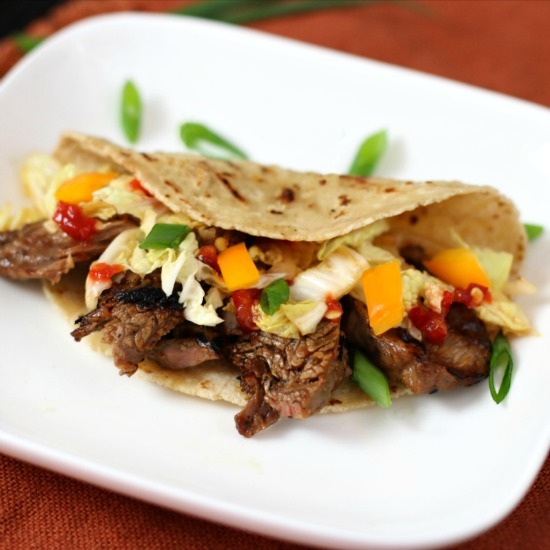 These Korean Style Beef Tacos are the perfect sweet and sour, tasty, speedy dinner to delight your taste buds any day of the week.